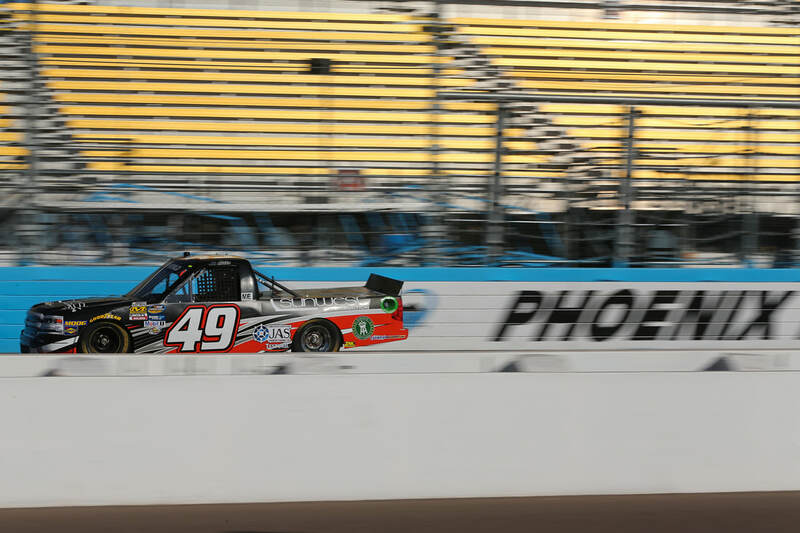 NASCAR Camping World Truck Series driver Robby Lyons made his truck series debut last season at ISM Raceway (formerly Phoenix Raceway) in the Lucas Oil 150 for Premium Motorsports. Lyons had a very successful debut finishing in the 12th position. Lyons went on to earn a 24th place finish in the Ford Eco Boost 200 at Homestead-Miami Speedway. I said it last year and I will say it again this year, his name might not be one all fans are familiar with now, but they will be in 2018. In only two career starts Lyons showed tremendous consistency. Lyons will have a chance to show how talented he truly is as he will run the full 2018 NCWTS schedule in the No. 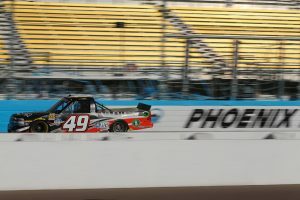 15 truck for Premium Motorsports. Lyons has had some track time already this year at Daytona International Speedway when he tested the #10A Fast Track Racing Chevrolet owned by Andy Hillenburg. The fastest lap that Lyons ran was on his 8th lap of the day where he clocked in at 51.874 seconds (173.497MPH). It was the fastest lap ran by any Fast Track Racing driver that morning. Lyons focused on single car runs and learning different lines around the speedway all which helped make him more comfortable with the truck. 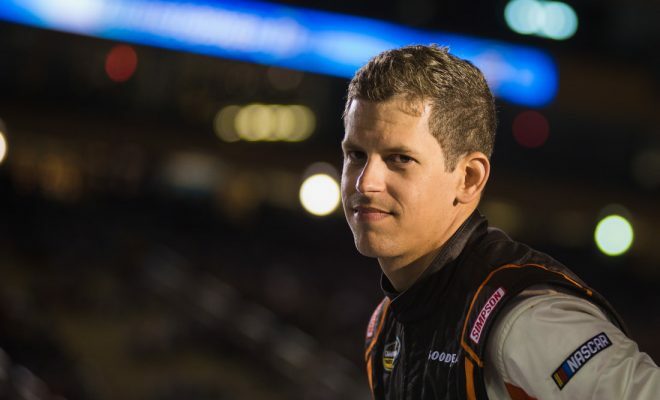 Lyons will be ready to go for his next event on the schedule which will be the NEXTERA Energy Resources 250 at Daytona International Speedway on Friday February 16. I recently had the chance to ask Robby some questions about racing, the opportunity Premium Motorsports has given him and the upcoming season opener at Daytona. Sarah Handy: You were able to test some at Daytona earlier this month, how important was that for you? Robby Lyons: That’s honestly a tough question, I think like, at Phoenix or Homestead last year for example, it would have been a much bigger deal. Daytona and Talladega aren’t the ‘trickiest’ places to get around, it’s more the style of racing that’s so different and until we get out there in race conditions it’s hard to get a good idea of what it’s really going to be like. I think the most important part, though, was having Andy Hillenburg on the radio and coaching me around the track while we were doing single car runs. Being that I’m in the #15 truck this year, we have to qualify in on speed and qualifying at Daytona is all about being smooth on the wheel and holding that steady line, both getting up to speed coming to take the green and during your fast lap. With only one lap to log a lap now, getting through the gears and maximizing that momentum on your out lap…that was something I really got a lot out of with the test and I believe it will pay off here in a couple weeks! SH: As a race car driver what do you think will be the most challenging thing about the season opener? RL: Patience, absolutely have to be patient. Us race car drivers can probably be the most impatient people on the planet! But at Daytona and Talladega that aggression doesn’t pay off until the end, and even then sometimes you’re just stuck with the hand you’re dealt. I’m certain that you have to go into that race with a plan, either to ride to the end and have a clean piece or go to the front and try to stay ahead of all the drama. Being a small team, we can’t afford to wreck a whole lot of trucks, so being there at the end will definitely put us in a position to start the year on a high note, maybe even a win! SH: You’re back with Premium Motorsports this season after running two races with them in 2017. What has this full-time opportunity meant to you personally? RL: I truly don’t think words could describe it, as long as I could possibly sit here and try to come up with an explanation that does that feeling justice, I just don’t think that it’s possible. When I got home from dinner with a buddy of mine back on Jan 19th my parents were sitting in the kitchen at the counter and I knew something was up (what did I do now?! Haha) and we had been expecting to hear from Jay about whether the sponsorship deal had been signed or not. When my dad told me it was signed and that it was all happening as planned, I lost about all the feeling in my legs! I guess it’s kind of like those videos you see where the groom passes out at his wedding. Haha. But it was a special moment in my life, dare I say the most special to date, to be able to share that moment with them. To be honest, it still hasn’t sunk in yet. Jay Robinson (Owner of Premium Motorsports) I have to say is the most stand-up, straight-shooting, classy and brilliant man I have met to date in my racing career, it’s no surprise to me that everyone in the garage area respects him as a competitor and person both. The opportunity he has presented me with this year was beyond my wildest dreams and I know working together will not only be productive on and off the track, but a lot of fun too. Hopefully there will be some rounds of golf included. Haha. SH: Is there a track on the schedule this season that you’re most excited for? RL: My dream since I was 5 has always been to race at Daytona. Being from Clearwater originally, it has always been our ‘home track’ when it comes to NASCAR. Homestead was really cool to race at, I had been going to races there as a fan since 2000, but it’s 4 hours away and not really close to family and friends. My family and I have been going to Daytona since July of 1998, and I’m always proud to say I’ve never missed a race since. 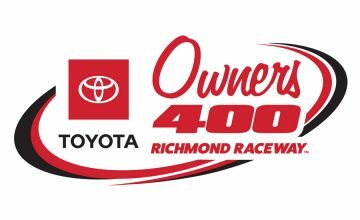 This year will be the 20th straight year and to be lining up there to race, as a competitor in one of the top-3 series in NASCAR…if that doesn’t get me excited I need to check to see if I still have a pulse! And just to add to it, my dad started coming to Daytona back in the late 60â€™s and my grandfather as well. I know it will be special to all three of us. Besides Daytona, probably Bristol. I raced my super late model there back in the spring and it’s just as raw a race track that you can go to. You can run all over the place, the speeds are high and it’s not a place where aero matters all that much. So definitely looking forward to the trip up to Thunder Valley in August. SH: What are your thoughts on stage racing? Do you feel it benefits the smaller teams no matter which series it’s in? RL: I feel like it absolutely benefits us smaller organizations. The caution clock that they used back in 2016 was too gimmicky and I think you would see how, pending when the last caution came out, it would almost not even become a factor due to it being timed. The stages having a lap dedicated to each of them is a lot more consistent and I think consistency is something NASCAR needs more of. Don’t get me started on the schedule though! Haha. But back to the point, when we didn’t have the stage breaks, the gap between us and the teams like KBM grow wider and wider (on the track) but with the stages, we can play strategy a little easier and have a chance to stay on the lead lap. As a fan, the stage racing adds a lot more to the race experience, it’s almost like watching 3 races in one. And I think like we saw in Cup last season with Martin Truex Jr, those stage wins can make all the difference at the end of the year. I know there have been discussions about adding more stages but in my opinion, like I said, consistency would be the way to go here. I think what we have now is great, and I hope it stays that way long-term. SH: Most of your fans know you’re into the iRacing software. 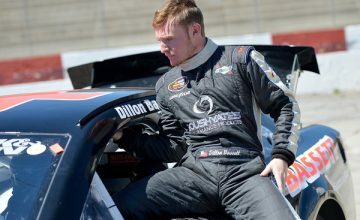 How has it benefited you in NASCAR so far? RL: I think there are several ways, some a little more subtle than others, but probably every time I go to a new track or drive a different vehicle, getting out there on iRacing has gone a long way to helping me be confident and comfortable when I roll out there for the first time. The best example I could think of was at Phoenix back in November. Up until that point I had always said that Phoenix was my ‘least favorite’ race track online, just because it was easy to overdrive. I had talked to Joey Gase at Talladega a couple weeks prior and he echoed those sentiments. But, regardless of how I felt about the place I went and logged a ton of laps. When I rolled out of the garage for the start of first practice (and remember, my first EVER laps in NASCAR) the butterflies went away almost entirely and I felt like I was back on iRacing making laps like I had earlier in the week. Now, the physics are hard to sell to someone who has been out there and done it, you can’t feel the car from your computer chair, but the bottom line and the biggest factor for me was that the view out the windshield was identical, the sound was accurate, and minus that feeling that we all love, it was pretty mind-blowing how accurate the visual iRacing world has become, and it’s only getting better. Huge props to Steve Myers and the whole iRacing team for the work they’ve put into it. SH: What is the best piece of advice you would say you have received in your racing career so far? SH: What would you say is the biggest adjustment you’ve had to make going from Motocross Racing to the NASCAR Camping World Truck Series? RL: Oh wow, I don’t know where to start with that one! Even though it seems like ages ago, I definitely remember going into my first test, driving a legend car, thinking ‘oh man I got this, this is going to be so easy compared to moto’ and I even remember thinking I’d be bored after long. I couldn’t have been more wrong, let’s just say I got humbled VERY quickly! Haha. The way you attack a race track on a motorcycle is the opposite of how you attack a corner on asphalt and especially oval racing. The biggest adjustment was learning to let the car roll through the center of the corner and not try to power through it. In motocross, if you try and roll the center of the corner all you’re going to do is taste what type of dirt they use on the track, which won’t be hard since you’ll be laying in it! Just to summarize though, I definitely had to learn that same patience that we talked about at the start. That, and pumping the emotional brakes here and there, Iâ€™m a fiery competitor on the inside even though most people see my friendly, chill and happy-go-lucky demeanor outside the car. Keeping a cool head when you’re behind the wheel keeps everything else cool. SH: Is there anything else you would like to add or say to your fans? RL: First and foremost I want to thank the One that got me here today and the One who guides my steps each and every day, my Lord and Savior Christ Jesus. Thank YOU for giving me the opportunity to tell my story. My biggest fans, my parents Bob and Dena, as well as the many other members of my family who have always encouraged me to chase my dreams. Brandon Thomson, who has been my crew chief, mentor and best friend since the start of this journey 5 years ago, Garrett Smithley for being the most inspiring and encouraging roommate and partner in crime (well, not really crime but it’s debatable, haha.) Jay Robinson, Stacey Carlson, Brian Keselowski, Jeremy Labretone, Mike Groves, Shane Pagoota and so many others at Premium Motorsports for being not only great teammates but great friends as well. And to the fans that support me, you really don’t know how special your commitment and energy inspires and pushes me to compete, and to keep moving forward to make sure I stay here in this sport to give YOU guys and girls something to cheer for. If you ever see me around at the track please come say hey! I can promise you that I have all the time in the world for you, the fans, over any other commitment at the race track (besides, well, racing. Haha.) Spending time talking with you and hearing your stories is one of the best parts of racing at this level, I get to hear about you, and learn more about life. I appreciate each and every one of you and can’t wait to get a checkered flag for you! If you #BEL15VE then anything is possible. Let’s go racing! I would like to thank Robby for taking the time to answer the above questions and we here at Rubbings Racing wish him the best of luck in his first full-time season in the NCWTS. If you would like to follow Robby or his team on their social media channels the links will be provided below. Very awesome article. I dont follow the truck series that much but this year I will.